The citron is borne by a slow-growing shrub or small tree reaching 8 to 15 ft (2.4-4.5 m) high with stiff branches and stiff twigs and short or long spines in the leaf axils. The leaflets are evergreen, lemon-scented, ovate-lanceolate or ovate elliptic, 2 1/2 to 7 in (6.25-18 cm) long; leathery, with short, wingless or nearly wingless petioles; the flower buds are large and white or purplish; the fragrant flowers about 1 1/2 in (4 cm) wide, in short clusters, are mostly perfect but some male because of pistil abortion; 4- to 5-petalled, often pinkish or purplish on the outside, with 30 to 60 stamens. 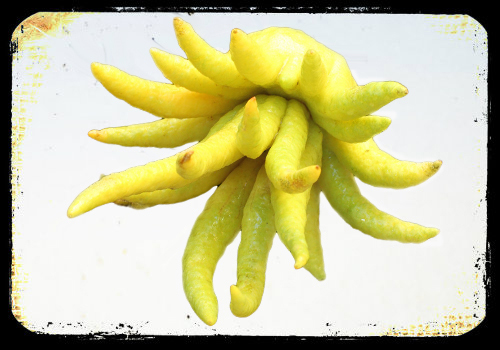 In Japan the "bushukan", as the Buddha’s Hand citron is called, is a popular gift at New Year’s, for it is believed to bestow good fortune on a household. The fruit is fragrant, mostly oblong, obovoid or oval, occasionally pyriform, but highly variable; various shapes and smooth or rough fruits sometimes occurring on the same branch; one form is deeply divided from the apex into slender sections; frequently there is a protruding style; size also varies greatly from 3 1/2 to 9 in or even 1 ft (9-22.8 or 30 cm) long; peel is yellow when fully ripe; usually rough and bumpy but sometimes smooth; mostly very thick, fleshy, tightly clinging; pulp pale-yellow or greenish divided into as many as 14 or 15 segments, firm, not very juicy, acid or sweet; contains numerous monoembryonic seeds, ovoid, smooth, white within.